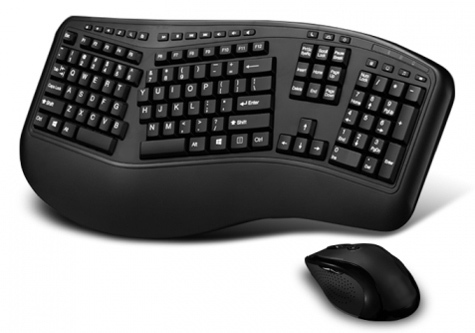 Our Tru-Form Wave Wireless Ergonomic Keyboard & Optical Mouse combo offers users two advanced input devices with ergonomic design, multifuctional features and a wireless range of up to 30 feet. 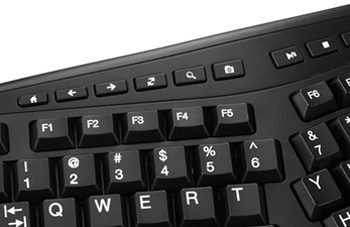 The design of this keyboard with split key zones and gently sloped shape encourages natural positioning of your hands, wrists, and forearms for maximum comfort during extended use. The included wireless laser mouse not only provides comfortable ergonomic design but is also equipped with a DPI switch for fast and easy resolution changes (800 - 1200 - 1600) and two Internet navigation buttons.